Do you like to eat spaghetti from Jollibee made from home? Can you make spaghetti tastes like from Jollibee? You can make a homemade Jollibee spaghetti out of this recipe and simple procedure on how to cook with this instant recipe. If you're stumble upon here, then spaghetti is one of your favorite foods you really want! We all know that Jollibee is one of the most popular fast food company in the Philippines just like McDonalds, Chowking, and many more fast food installed here in the country. Spaghetti is one of the Jollibee's most serve value meal to the Filipino customers and also to foreigners as well who love to eat in this fast food company that located in malls such as SM mall, Gaisano Mall, Elizabeth Mall, and many other malls. If you could feel how cheesy it is when you're eating Jollibee Spaghetti with sweet tomato sauce with meat and cut up sausage and hotdog pieces. This kind of spaghetti that we are going to have is different from any kind of spaghetti like Italian spaghetti. This is a pinoy style spaghetti. This is just like making your own version of spaghetti you want to have exactly near the same from a Jollibee that you have tasted. Here's the recipe of the spaghetti that you want to cook just like from the Jollibee fast food. 1. Slice the chiken hotdog into to pieces. 2. Fry the angus beef patties or angus beef corned beef with the mixed onion and garlic. 3. Add with a Sprite softdrink and let it boil for three minutes. 4. Add the pepper and add the hotdog and ham. 5. Add 3 spoon of liquid seasoning. 6. Then add the nestle cream, banana ketchup and tomato ketchup. 7. Add 1 glass of water. 8. Let it boils for five minutes. 9. Then add the spaghetti sauce and the liver spread. 10. It's time to taste and add some sugar according to your cheesy taste. 11. Finally, add the kraft edden cheese. After this simple step on how to make a homemade spaghetti in Jollibee style, the spaghetti you have cook is now ready to serve. It's eating time. More cheesy eating from these home made spaghetti. 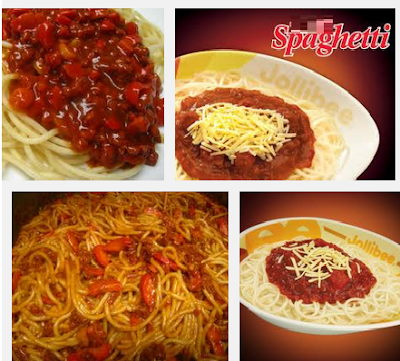 That is how to make a Jollibee spaghetti by following those recipe and simple step. Now, it's your turn to make your own spaghetti!